Tubie is a puzzle consisting of a stack of 6 disks inside a transparent tube. The disks can rotate about the main axis, and they each have two or three small pins around the outside. The tube has a comb-like row of pins too. By turning the tube, the pins engage and the disks are turned with it. The tube can be slid along the axis slightly so that it is in a position where all the pins miss each other, and then the tube can be rotated to a different position without moving any disks. The disk at one end has no pins at all and does not rotate. It is used as a reference point for the other disks. 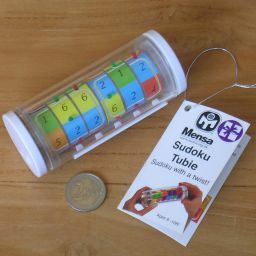 Apparently there have been many designs of the puzzle, but the Sudoku design is the most common. In this design every disk has the six numbers 1 to 6 on it in some order. The main aim is to arrange the disks so that each column contains all six numbers. You can also try to arrange them so that there is a column containing only one number, repeated six times. The latter is possible with any of the numbers. The Tubie homepage contains a description, solutions, a playable version, and more. There are five movable disks, which each have six valid positions. This gives a total of 65 = 7,776 positions. It turns out however that only 7,560 of these are attainable using complete moves. The 216 inaccessible positions can only be reached if you do partial moves, e.g. rotating some disks half a step so as to separate the pins from each other. The 216 inaccessible positions are due to 18 inaccessible pin arrangements. These can occur in any of the six locations relative to the fixed disk, and the sixth disk can be given a half turn without changing the pin arrangement. Here is the solved Sudoku arrangement. Hold the puzzle horizontally, with the fixed disk on the left hand side. Number the moving disks 1 to 5 from left to right. A move will be denoted by the numbers of all the disks that are involved in the move, followed by a U or a D which indicates an upwards or downwards move. To perform such a move you first need to locate a row of pins that exactly matches the list of disk numbers, and then use the comb to push against that row of pins in the right direction a distance of just one step. The start position has all the red pins in one column. Put the comb directly below the red pin on disk 5, the right-most disk. If the teeth caught by the comb are not all red, then shift the comb left, move down two blocks, shift right again, and move back up two blocks. Repeat step d if necessary, until all the red pins are lined up. There are six possible starting positions. I will number them 1 to 6, according to which number shows on the fixed disk just above the row of red pins. You can of course do one or more 12345U or 12345D moves to get to the other starting positions. The table below shows how to reach any of the solved positions starting from any of the other solved position or starting position.